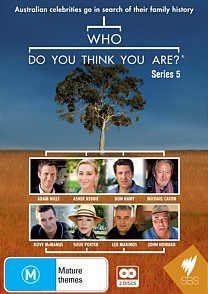 Who Do You Think You Are Series 5 DVD Review The popular documentary series Who Do You Think You Are returns to DVD, thanks to a successful run on SBS. The popular documentary series Who Do You Think You Are returns to DVD, thanks to a successful run on SBS. The premise behind the series is simple, investigate the lives of popular Australians such as Adam Hills or Lex Marinos and uncover their ancestry that may hold secrets and stories that these Australians never knew. It's also quite an emotional journey as these Australian identities let you into their lives and in essence tell the story that helped shape who they are today. The first episode focuses on Adam Hills, comedian and former host of Spicks and Specks who is given a real history lesson on his ancestry. Although his mother is of Maltese descent, we learn that he had nobility in his lineage and the show manages to trace back his heritage to 1460 to that of Matteo Vassallo. That's quite an impressive feat! Another highlight of the series was Don Hany who knew virtually nothing of his Hungarian heritage. However as the episode continues, both Don and the viewer discover the dark history of his Hungarian grandfather, Jozsef Szabo and due to the show, he managed to reunited his mother with her sister who have not spoken for over 30 years. Quite a touching episode. What makes Who Do You Think You Are so compelling is the journey that these identities are taken on. Not only is it an emotional rollercoaster ride but we learn some hidden secrets that they have allowed the Australian audience to share such as stories of war, depression, health and escape from prejudice. Running at over 400 minutes, this series will captivate you, sometimes make you cry, laugh and experience a truly emotional journey that helped create these amazing individuals.